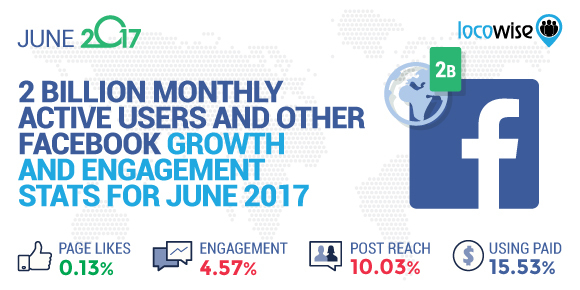 Welcome to the Facebook page likes growth and post engagement study for June 2017. We analyse the performance of 5,000 Facebook pages to help you understand what the standards are on Facebook. Page likes growth, post reach, content engagement, post format performance, and the use of Facebook advertising to boost the organic content. This helps you see how your own pages perform against the standards and better understand the results of your efforts. Do you want an even deeper comparison of your pages to the standards on Facebook? Take a free Locowise trial. Page likes growth in June was at 0.13% of the audience. This is 18% higher than in May. Post reach was at 10.03% of the audience which is a 6% decrease compared to May. Engagement rate was at 4.57% of people reached which is 2% lower than in May. 15.53% of pages used Facebook Advertising paying for 36.51% of their total reach. Video continues to be the king of content formats. Videos reached 11.08% of the page likes. Photos reached 10.49%, links 6.66% and status updates reached only 4.5%. Videos also engaged the highest number of the people reached. Videos engaged 5.15%, photos 4.21%, status 4.11% and links only 3.99%. If you’re not posting videos, you’re losing out on the potential of widening your organic reach and engagement. Is the lack of a budget the main cause for the lack of videos in your content strategy? Try this guide to find out how to create videos with free tools. The videos don’t necessary have to be anything advanced either. Many pages are seeing results by posting pictures or text in a video format. Facebook now has 2 billion monthly active users. 66% of them return back every day. News feed algorithm has had another update during the month to reduce the amount of spam and fake news. Pages with a very high posting frequency – 50 posts or more per day – will get their distribution cut on the network. Another change done in order to fight fake news is the decision to not allow pages to customise the headlines, descriptions and thumbnails of the links that they post. This restricts the regular social media managers a lot too. It’s a fairly common behaviour to optimise the headline and description to make it more social media friendly. We believe social teams would need to work closely together with the content teams in order to optimise these on the website itself from now on. Alternatively, you can always run ads as for ads you are still free to optimise the metadata as much as you want. 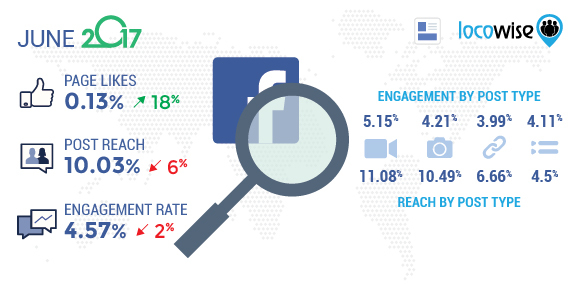 Facebook has announced several new metrics for advertisers and page admins. One of the most interesting ones is the “landing page views” metrics. Users might click on the links in your ad but they may never make it to your landing page if your site is down or too slow to load. This metric will show exactly how many do reach your website. It will be interesting to see how close the clicks metric is to the views metric. Ideally, all brands should aim to optimise for as close to 100% as possible. 100% of your ad clicks should end up on your site too. Otherwise you are wasting some of the money you’re spending on the ads. An advertising report has shown that Facebook video advertising viewability is as low as 20%. In other words, only 20% of video views the brands are paying for are actually real video views as according to the industry standards. The issue here is that the advertising industry and Facebook have different standards and definitions for what a video view is. According to the industry, a video view means that “a minimum of 50 percent of a video ad’s pixels must be in view for two continuous seconds”. Facebook argues that 50% and two seconds are too long and that brands see benefits as early as after 0.25 seconds of a video has been viewed. 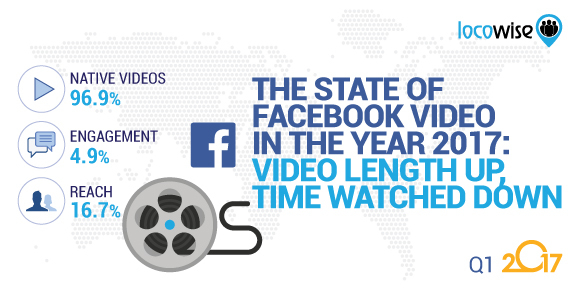 See more on the performance of Facebook video in our “state of the Facebook video world” study for the year 2017.